CANTON, Mass. 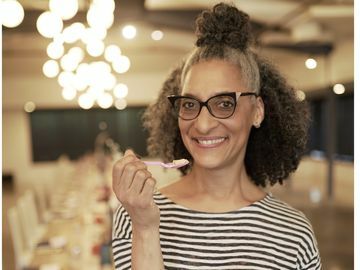 (August 4, 2014) – Baskin-Robbins, the world’s largest chain of ice cream specialty shops, is helping guests beat the heat this month with a delicious lineup of frozen treats featuring OREO® cookies, AMERICA’s FAVORITE COOKIE®, as well as a range of sensational summer flavors. 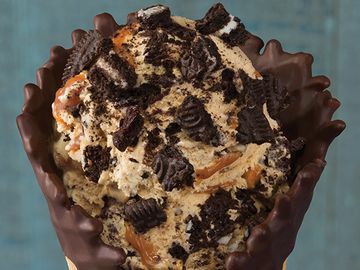 The lineup includes Baskin-Robbins’ August Flavor of the Month, OREO® Nutty Salted Caramel, which is packed with OREO® cookie pieces, honey glazed peanuts and a salty caramel ribbon in vanilla-flavored ice cream. 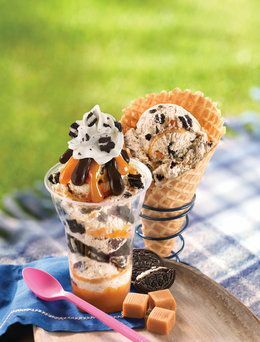 OREO® Nutty Salted Caramel Layered Sundae – OREO® Nutty Salted Caramel ice cream, caramel praline topping, hot fudge, crushed OREO® cookie pieces and real whipped light cream. OREO® Cookie Cake – An ice cream cake drizzled in dark chocolate, adorned with a circle of OREO® cookies on top and edged with a fudge border. 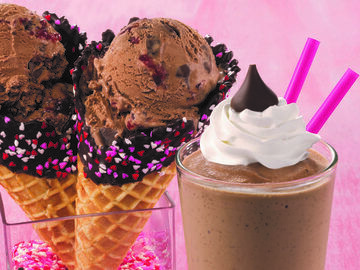 This design is available for ordering both in-store and at www.BaskinRobbins.com/onlineordering. OREO® Ice Cream Cookie Sandwich – These cool treats are made-to-order with a guest’s favorite ice cream flavor sandwiched between two OREO® Cookie Wafers. The OREO® Ice Cream Cookie Sandwiches are also available in pre-made 6-packs at participating Baskin-Robbins shops nationwide. OREO® 31° Below® Lineup – AMERICA’s FAVORITE COOKIE®, is blended with smooth and creamy vanilla Soft Serve in three varieties, OREO® ‘n Chocolate, OREO® ‘n Caramel and Classic OREO® Cookies ‘n Cream. S’More the Merrier – Marshmallow and graham cracker ice cream, milk chocolate chips and a crunchy graham cracker ribbon. 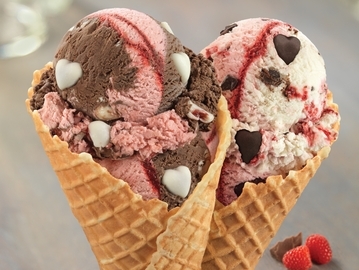 Peanut Butter ’n Jelly – Peanut-butter-flavored ice cream with grape jelly and peanut butter ribbons. Tropical Vacation Frozen Yogurt – Pineapple and passion fruit-flavored frozen yogurt with a passion fruit ribbon. Wild ‘N Reckless – A green apple, blue raspberry and fruit punch-flavored sherbet party. 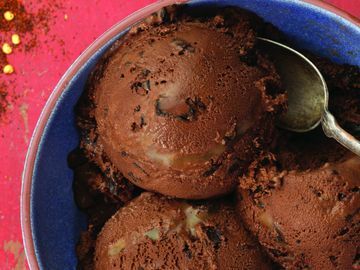 Fudge Brownie – Chocolate fudge ice cream loaded with fudge brownie pieces and walnuts. The OREO® cookie frozen treats and summer ice cream flavors are available at participating Baskin-Robbins shops nationwide throughout the month of August. Ice cream lovers can bring home the August Flavor of the Month, OREO® Nutty Salted Caramel, in fresh-packed containers to enjoy with family and friends or to create their own specialty ice cream desserts. OREO®, the OREO® Wafer Design and AMERICA’S FAVORITE COOKIE are registered trademarks of Mondelēz International group, used under license.